The International Centre for Integration and Cohesion exists to improve social cohesion and integration in Britain. Our mission is to bring communities together in promotion of tolerance, unity and shared values. Initially established by British Iraqis in West London, our reach has since broadened to include any groups seeking to promote integration. We work with a number of different communities in the UK as well as internationally. 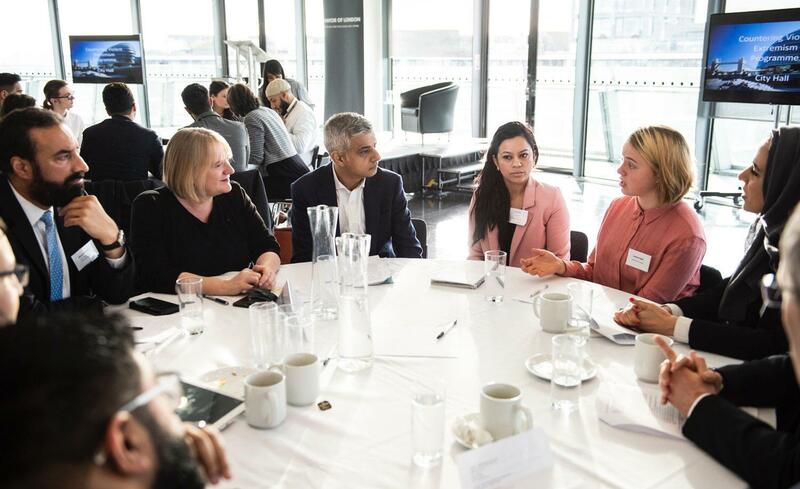 ICIC were invited to City Hall and join other London community representatives to discuss initial findings of MOPAC’s Countering Violent Extremism Programme, which the Mayor called for in 2018. The research programme seeks to deliver tailored focus groups aimed primarily at young Londoners, aged 13-26. The MINAB is launching a Next Generation Programme in East London – to build a “stronger community network”- to enhance social action in local communities by supporting mosques and imams to strengthen social integration and community programmes. We are recruiting 20 young leaders aged 18-30 years old from across East London to join the Building Stronger Communities Challenge – Increasing the involvement of young leaders in mosques and community programmes through personal development. On 27th September, as part of our ongoing efforts to building more resilient communities, ICIC held a workshop which was delivered by the Institute of Strategic Dialogue (ISD) entitled ‘The Contemporary far-right; Trends, Tactics and Key Players’. The workshop was designed to inform ICIC and its partners of the current issues and trends in regards to far-right movements. As part of our Encouraging Resilience programme, ICIC in collaboration with Faiths Forum for London (FFL) delivered a 5 Day bespoke programme to encourage young leaders to participate and engage with democracy, which ran between 2nd - 6th July 2018. Click here to read more about this programme. On 19th June 2018, #TurnToLove and International Centre for Integration and Cohesion (ICIC) and volunteers from London’s interfaith and youth communities, came together to honour the victims of last year’s far-right terror attack in Finsbury Park, to reaffirm that Love and Unity will win over Terror and Hate. On Wednesday 5th June 2018, The All-Party Parliamentary Group on British Muslims organised a historic event and brought ‘The Big Iftar’ to Parliament with the breaking of fast taking place at Speaker’s House hosted by The Speaker, Rt Hon. John Bercow MP. @FXRebateClub Really bad at communicating! On 27th September, as part of our ongoing efforts to building more resilient communities, ICIC held a workshop which was delivered by the Institute of Strategic Dialogue (ISD) entitled ‘The Contemporary far-right; Trends, Tactics and Key Players’. If you would like any further information about the International Centre for Integration and Cohesion and the programmes we run, please get in touch. By submitting your details you accept the terms and conditions and you agree to comply with the terms and conditions and that the International Centre for Integration and Cohesion may contact you by email. Want to keep updated with our goings on? You can also contact us about volunteering opportunities, donations and with suggestions for community events.